Here is the new HOT 100 vibes in the city…. For anyone who thinks that Jamaica Plain is all hippies, gays, and green-minded food and fun, you’re only almost right. It’s also one of the Hub’s great destinations for authentic Boston-Irish drinks and fare, from the Jeanie Johnston Pub and James’s Gate to the Brendan Behan Pub in Hyde Square. New among this rogue crowd is The Haven (2 Perkins Street, Jamaica Plain, 617.524.2836), which also prides itself on old-country heritage, but shifts the theme to Scotland and its own gluttonous traditions. 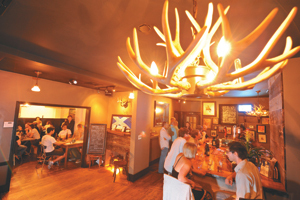 Among other things, that means antler chandeliers, ale-braised beef pie with potatoes and onions, Haggis, and guys in skirts who might beat you down for cheering on England in a soccer (er, football) match. It also has a phenomenal selection of “session” micro-brews, which are essentially beers so special that you stick with them for a whole sitting.